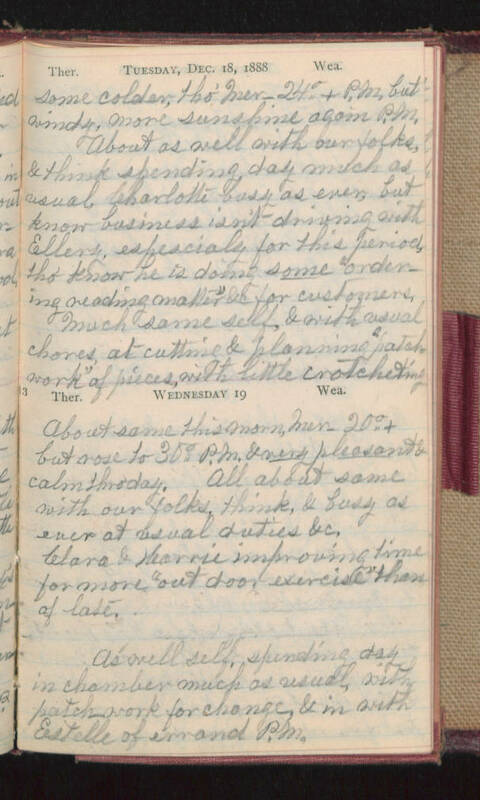 Tuesday, Dec. 18, 1888 some colder, tho' Mer- 24°+ P.M. but windy, more sunshine again P.M. About as well with our folks, & think spending day much as usual. Charlotte busy as ever, but know business isn't driving with Ellery, espescialy for this period, tho' know he is doing some "ordering reading matter" &c for customers. Much same self, & with usual chores, at cutting & planning "patch work" of pieces with little crotcheting. Wednesday 19 About same this morn, Mer- 20°+ but rose to 30° P.M. & very pleasant & calm thro' day. All about same with our folks, think, & busy as ever at usual duties &c. Clara & Karrie improving time for more "out door exercise" than of late. As well self, spending day in chamber much as usual, with patch work for change, & in with Estelle of errand P.M.